Jim Boeheim has overseen a rare season shy of 20 wins, while still awaiting word from the NCAA. 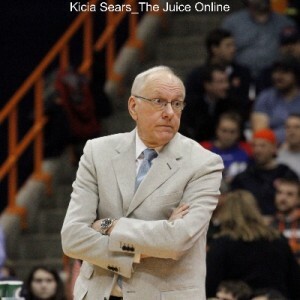 Item: It is simple math, at currently 34 wins shy of the almost incomprehensible 1000 total victories in his career, unless a new-look Orange squad next season mirrors the 2011-12 Elite Eight team’s 34 win campaign, the SU coach will have to be on the bench for his 41st season in 2016-17 to hit the 1K mark. After six straight glorious NCAA Tournament seasons in which the program averaged an astounding 29.5 victories per year, this rare season of not hitting 20, only the third of the Boeheim era which concludes Saturday in Raleigh against N.C. State (12:00 p.m. ET / CBS), serves as a reminder of the gratifying status of following the sport’s fifth all-time winningest program, and the accompanying record 44 year streak of not having a losing season. With the continued collective anxiousness enveloping Orange Nation awaiting the verdict from the NCAA Committee on Infractions, an interesting thought to ponder is that even though the COI is an independent group deciding various cases of infractions, how much awkwardness would swirl around campus if the COI renders its findings before the university hosts the NCAA East Regional on March 27 and 29? At well over four months and counting since October’s hearings it seems unreasonable to think the delay would last anywhere near more than another three weeks, then again, most of us didn’t think we would be waiting this long to find out the depth and breadth of what was dissected, and the possibility that could include forfeited victories that may increase the number Boeheim has to achieve to officially hit 1000. If the announcement comes before the regional, no doubt one of the additional storylines to the four teams competing inside the Dome for a Final Four slot in Indianapolis, would be the spotlight on the host school not only having already made itself ineligible for post season play, but having to keep its chin up in the face of whatever the NCAA discloses (not to mention how that portrays Boeheim, and if the SU coach goes near the spotlight of a March Madness TV gig somewhere). 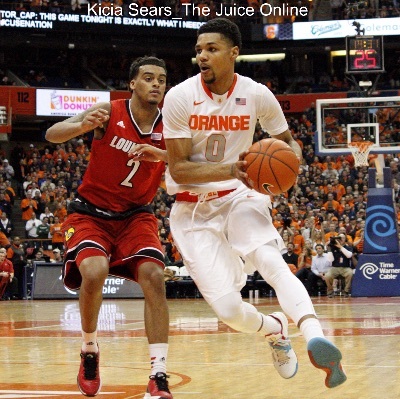 Besides the quest to knock another notch off of Boeheim’s 1000 target and to go out on an up note with a road win Saturday against the Wolfpack, this year’s squad (18-12, 9-8) will undoubtedly not look like next year’s team with Rakeem Christmas’s departure after an all conference season, the expected returns of Chris McCullough and DaJuan Coleman, the possibility of a transfer, or two, and the arrival of the currently four-deep recruiting class. As he praised the play of Christmas and exhaled with his honest thoughts about the surprising 18 victories to date following the Virginia loss Monday night, Boeheim also gave a hint as to some of the key areas he’ll be concentrating on next year, his 40th in charge. 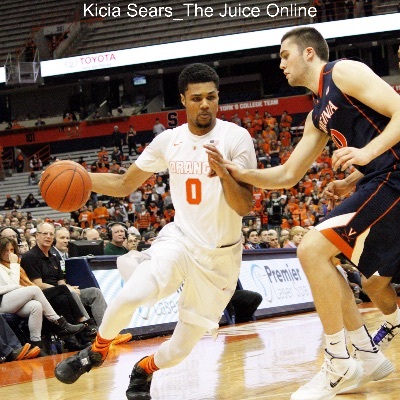 And it also serves as a succinct summarization of an unusual, by Syracuse standards, non-20 win season.